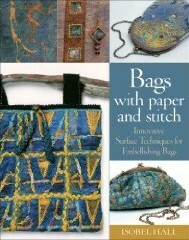 Exploring the art of papermaking, this reference provides instructions on how to transform distinctive papers into unique, one-of-a-kind handbags by using modern crafting techniques. Showcasing dozens of exquisite handmade bags and the methods for achieving similar success, this guidebook provides secrets for creating bags from various types of papers and materials, including silk cocoon strippings, linen, flax, merino, and paper clay. Details on how to personalize the bags with brooches, charms, trinkets, and other found objects accompany instructions on how to use embossing enamels and metals on paper fabric. With material lists and step-by-step instructions, this resource is an ideal companion for beginners and seasoned crafters alike. 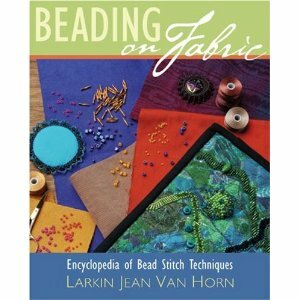 Textile or fiber artisans can add sparkle and texture to their work with this complete handbook to embellishing with beads. 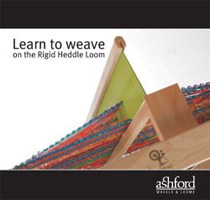 Beginning with a comprehensive look at tools and materials—covering all types of fabrics, threads, needles, and beads—the guide teaches stitches, edging, and fringe, as well as the proper care of beaded fabrics. The focus on technique allows crafters to easily integrate beaded enhancements into any type of existing project, and the experienced instruction covers bead choice, color schemes, and finishing methods for a polished look. 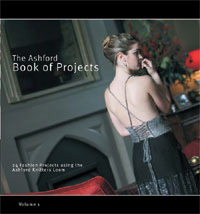 With its clear directions and a gallery of sample projects, this workshop-ready book will instruct and inspire. Beadwork for Fabric Artists shows you, bead by bead and stitch by stitch, how to add bead embroidery to your work for texture, color, and excitement. 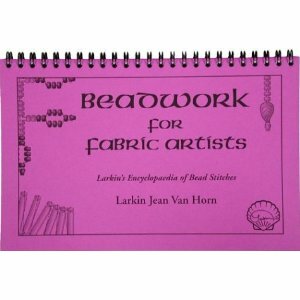 Well-known artist, lecturer, and teacher Larkin Jean Van Horn shares eight glorious pages of her beaded work in full color, and in clear text and diagrams shows the component stitches that went into her work, which will allow you to extend your own work in the same ways. 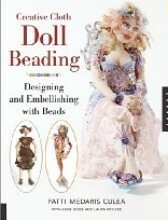 The book covers seven techniques for adding beads directly to fabric, six techniques for additional texture and fringe, several edge treatments, and three ways to firmly hold larger elements called cabochons onto your pieces. The book is Wire-O bound, so it will lay flat on your table while you work, making it easy to refer to as you learn each new stitch. Your results will be stunning, dazzling, and complex, but Larkin makes every step along the way easy. Don’t wait to add sparkle to your next quilt, garment, or other fabric piece! 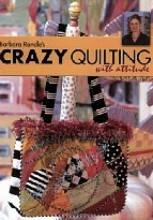 Barbara Randle, successful sewing artist, introduces a fresh approach to a wonderful age-old art--the use of extravagant color combinations and easy stylish designs combined with basic crazy quilting techniques for home decor and fashion items. 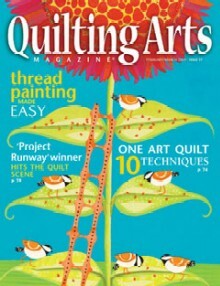 Quilters will create exciting new decorations by applying fuzzy trims, beads, and tassels to favorite fabrics. Photographs and detailed step-by-step instructions guide readers through constructing crazy quilting projects they will be proud to display, including throw pillows, purses, Christmas stockings, lampshades, and more. Readers will learn the essentials of selecting fabrics and creating unexpected, explosive color combinations with this new book. Craft projects a little dull? Clothes to basic? Lampshades look naked? All they need is a little dressing up with Creative beads from Paper & Fabric. Made from paper, fabric, nonwoven material, and other easy-to-obtain basics, these colorful beads add style and substance to any project. Children and adults will enjoy making rolled-fiber beads in three simple steps—cut, roll, and glue—then using their creations to produce new jewelry or to add dimension and excitement to any too-stark surface. No special tools are needed to get started—just one distinctive book. Though doll making is one of the oldest forms of artistic expression, contemporary artists continue to expand the boundaries of this craft by creating exciting new work that incorporates all types of media. 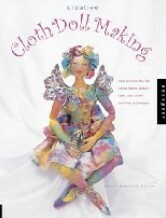 In this book, artists from around the world release their creative forces with glorious abandon as they take three simple doll patterns and turn them into one-of-a-kind works of art featuring hand-dyed fabrics, beads, stamping, colored pencils, and much more. Internationally known cloth doll artist and teacher Patti Medaris Culea brings together a collection of projects ranging from simple and elegant designs by emerging artists to elaborate dolls from premiere doll designers. These artists offer easy to follow instructions, tips and special insights, along with creative variations for each of the projects. The use of exquisite, space-dyed threads as an effective way to spice up embroidery projects takes center stage in this assortment of design templates, step-by-step instructions, and lavish illustrations for embroiderers of all ages and skill levels. Styles that work particularly well with these threads have been chosen for the projects, from the opulence of goldwork to the simplicity of ribbon embroidery. 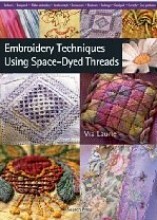 An introductory section outlines the specific uses of space-dyed threads and the techniques involved, while subsequent chapters focus on the most popular styles, including blackwork, casalguide, freestyle, stumpwork, and hardanger. Each completed project is fully photographed and includes several alternatives and additional stitched pieces to inspire the creation of fresh, original works. Twelve stunning purse accessories are yours to create using Faux Leather and Mock Croc. Mix and match a wide array of fashionable colors to complement your purse; then, make stylish handbag enhancers that call attention to your good taste. Key fobs and mini-pockets will help you keep up with little necessities. If you have a bag that needs a fashion boost, add a purse strap, a tassel, or a floral embellishment. One of the world’s leading textile artists introduces hobbyists and professionals alike to exciting new digital methods for designing and creating stitched artworks. 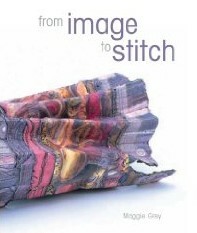 For example, starting with a photograph taken with a digital camera, this idea-packed book shows how to use a popular computer paint program to turn it into a striking abstract design, which can then be transferred to fabric with an inkjet printer and embellished with stitching, felting, and other crafts. 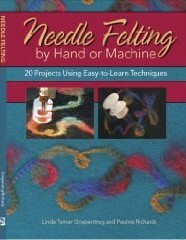 Complete with instructions for using innovative products such as InkAID and Shrinky Plastic, and lists of sources for copyright-free designs, the book provides a rich menu of techniques and effects. Large color photos showing both the design processes and the successful finished works offer instruction and inspiration. With a sense of humor and creative abandon, renowned mixed-media artist Beryl Taylor shows you how surprisingly easy it is to turn fabric, stitch, and embellishment into artistic treasures to keep and share. 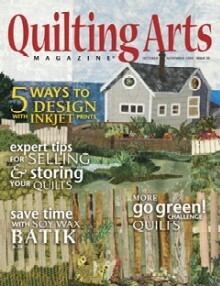 Using her own art as examples, Beryl gives step-by-step instructions for making projects like greeting cards, wall hangings, and books using the latest mixed-media techniques, all the while encouraging readers to follow their own instincts and experiment. In Mixed-Media Explorations you'll learn how to: apply basic design principles like layering, highlighting motifs, and creating grids to give your art depth and meaning; use six simple embroidery stitches to add interest and texture; turn favorite papers into fabrics that can then be stitched or quilted; "age" your art by etching, burning, and tearing; create richness with metallic threads, paint, and rub-ons; "embed" fibers and found objects; use everyday items like brown grocery bags, wallpaper scraps, and bleach to create texture; stitch through metal. 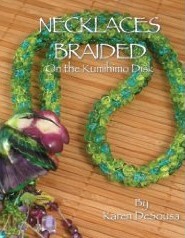 Necklaces Braided on the Kumihimo Disk is a step-by-step instruction book that tells you how to make and finish a stunning array of necklaces. 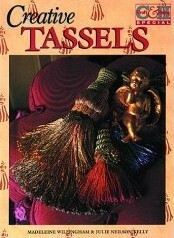 Whether you are a beginner or advanced braider this book has something for you. It includes move by move instructions for four braids. The section on braiding with beads shows you how to add beads of all sizes to your necklaces without ruining your disk. Fancy finishes shows you how to dress up the closures. 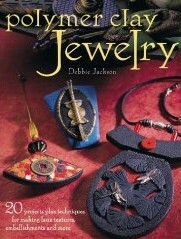 From project inception to the final touch, this book will inspire you to create your own stunning necklaces. Machine felting is one of the hottest things in fiber arts, building on the rich history of hand felting. With top sewing manufacturers adding felting accessories to their lines, a practical how-to guide is a great first step to enjoying this exciting craft. In this guide you'll discover the history behind this popular practice, which involves a piercing process with barbed needles to embed the fibers into the base. 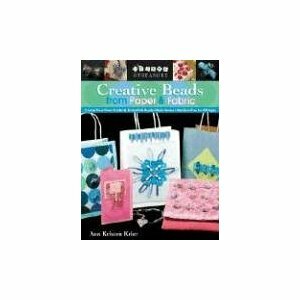 You will be inspired by the exciting projects and 200+ color photos and illustrations in this book, as you use your hand or machine to create felted items for your home, wardrobe or to give as gifts. Paintstiks on FabricEmbellish fabric with ease! Beginners and seasoned fiber artists alike can achieve fabulous results with Shiva Artists Paintstiks and a few simple tools. Learn everything you need to know about applying paintstik color to fabric from basic information about paintstiks to detailed instructions that will enable you to transform ordinary pieces of fabric into unique works of art. 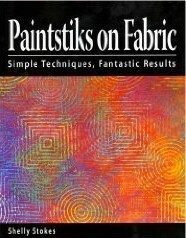 This comprehensive guide offers: Five techniques for adding paintstik color to fabric including rubbing stenciling and masking applications; easy-to-follow instructions with step-by-step photographs; answers to the most common questions about paintstiks; complete procedures for preparation heat setting and clean up; and dozens of color photographs for inspiration. With a gallery of stunning creations shown at the end of each section, this guide will provide readers with the skills and creative spark they desire to craft pieces of their own. Why put a pint-sized photo into a quilt when you can "posterize" it? 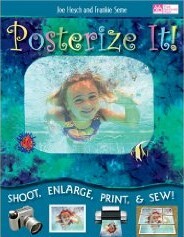 Blow up a photo to poster size, print it in sections, and sew the sections back together. It's never been easier to personalize a quilt piece by piece---and get picture-perfect results! 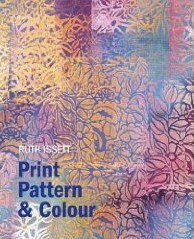 From one of the UK’s leading textile artists and author of Colour on Cloth and Glorious Papers comes a glorious celebration of the limitless potential of printing and repeat patterns on fabric. 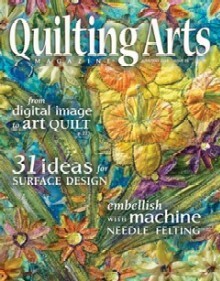 Aimed at fiber artists and designers, it is packed with imaginative techniques for a wide range of print methods and media. Mono-printing using sponges, rollers, and textured surfaces; screen-printing, including the use of photo-sensitive screens; using thickened dyes; developing ideas on paper; combining print with stitch and fabric manipulation; and incorporating metallic and pearlescent paints: it’s all here, with gorgeous color photographs to illustrate every idea. 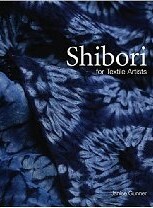 Shibori is the Japanese term (from the word meaning "to squeeze or wring") for the dye-resist technique of binding, clamping or gathering the cloth so that the dye cannot reach certain parts. The result is a most powerful combination: a carefully structured design with the organic freedom of the unpredictable. One of the richest textile traditions in the world, shibori has been used in Japan, Africa, India and South America for centuries to create vibrant color, bold patterns, and intricate motifs. In recent years, a resurgence of the art has revealed its full potential. 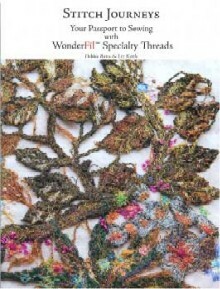 Janice Gunner's book is aimed at quilters, embroiderers and textile artists who want to master the techniques of shibori and to find ways of using the fabric for a range of textile applications. The book begins with the historical and cultural background of shibori; then goes on to explain, with clear, precise instructions and diagrams, how to make a wide range of exquisite fabrics. Gunner covers many different techniques, including tied-resist, stitched-resist, wrapped-resist, clamp-resist, folded- and pleated-resist, as well as immersion, space and indigo dyeing. Stunning examples of shibori pieces appear throughout the book both to inspire and guide; and practical advice is given on incorporating shibori textiles into the reader's own quilted and embroidered work. 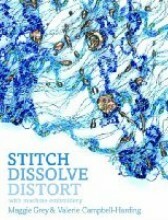 Featuring new and exciting techniques on how to dissolve, melt, and distort fabric both before and after stitching, this guide explores the evolving and innovative materials that are introduced into the textile market and instructs fiber artists how to use them creatively and effectively. Whether dissolving, melting, punching, slashing, or distorting textiles, crafters can achieve fascinating effects using the handbook's easy-to-follow steps, design tips, and diagrams. The book's organization around three themes—stitch, dissolve, and distort—allows experienced embroiderers to easily incorporate fresh ideas into their favorite stitching styles. Crafters and jewelry and textile artists will delight in the brooch projects in this guidebook that reveals how to make the basic shapes of lady brooches as well as how to embellish them to give each one a personality. 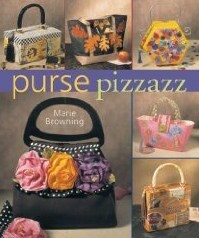 These crafts focus on embroidery, beading, wiring, and threading for making fabulous, fun, unique pins. The instructions take the crafter from start to finish, offering 20 individual and distinct designs to create zany, funky, female-shaped jewelry.